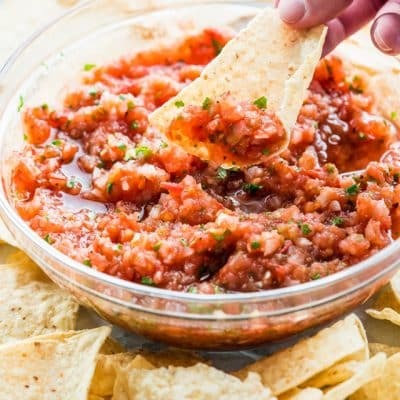 Homemade Salsa with fresh ingredients and full of flavor, just like the one you’re served at your favorite restaurant! This restaurant style salsa is made with roasted tomatoes and onions which enhances all the flavors. Delicious and simple! You know that salsa you get at Mexican restaurants the minute you walk in with lots of chips? Well, that’s my favorite part and I’ve never been able to get flavor that out of a jar! But this recipe is simple enough that you can make yourself at home with a handful of fresh ingredients. The first step for this recipe is to halve the tomatoes, quarter the onions, and throw them all on a sheet pan with the garlic. Toss the pan in a nice and hot oven, and let everything roast. I believe that roasting your tomatoes and onions gives the salsa so much complexity of flavor. I prefer to roast my own tomatoes rather than buy canned roasted tomatoes. It literally only takes minutes! I like to roast the tomatoes just until they start to slightly char. Now the hard part is done! Phew. All that’s left to do is dump the rest of your ingredients into a food processor or blender, and pulse until you have the perfect consistency. 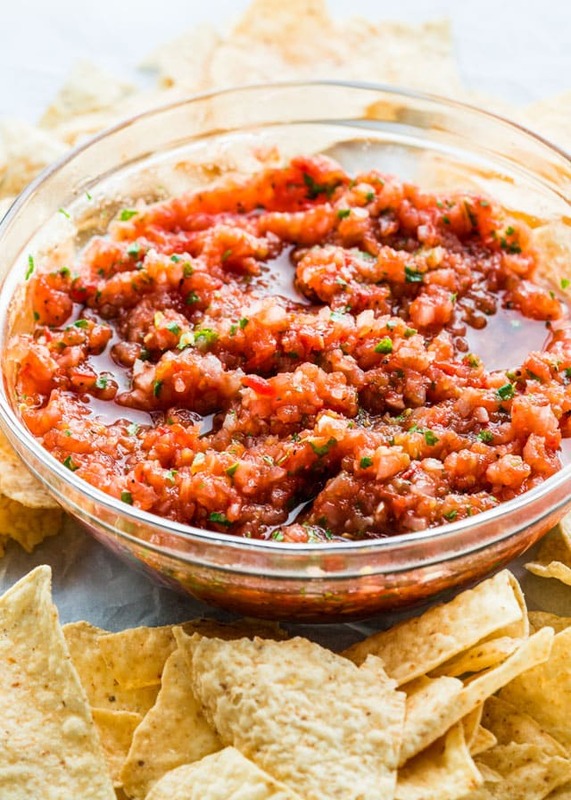 What Ingredients Are in This Salsa Recipe? For my salsa recipe I like to stick with the key ingredients. In my books those would be tomatoes, garlic, onions, cilantro, chiles or jalapeños and a little bit of lime juice. The beautiful thing about salsa is that you can really get creative with it and make any changes you want to create your perfect version. I did choose canned diced chilies in this recipe only because I wanted a milder salsa with a hint of smokiness, but if you want a spicier salsa, leave out the diced chiles and roast a couple of jalapeños along with the tomatoes. Or you can even use both. Totally up to you! Want to give it a nice kick? Use a habanero, scotch bonnet, or ghost pepper to really crank up the heat. I added a bit of lime juice, which is totally optional if you don’t like a tangy salsa. Last but not least, don’t forget to season well with plenty of salt and pepper. 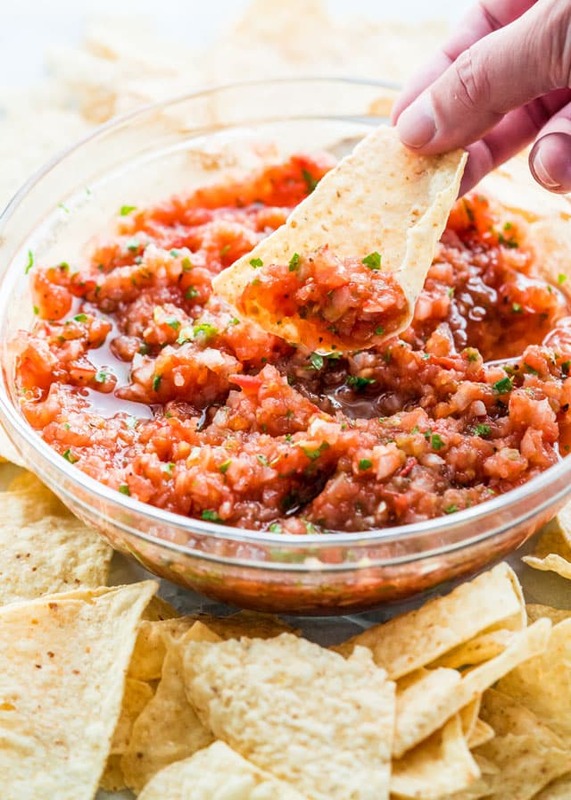 Homemade Salsa with fresh ingredients and full of flavor, just like the one you're served at your favorite restaurant! This restaurant style salsa is made with roasted tomatoes and onions which enhances all the flavors. Delicious and simple! 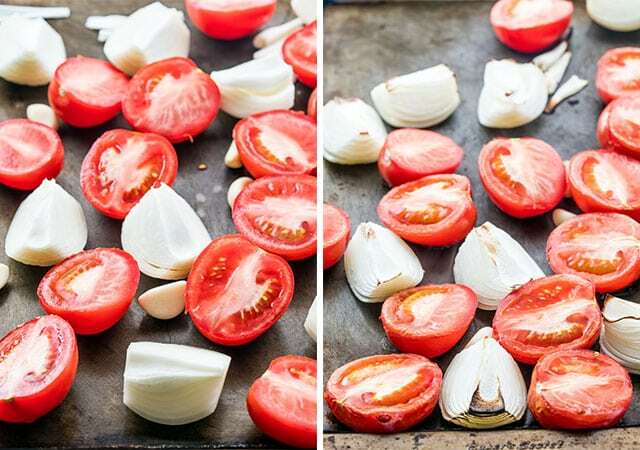 Place the tomatoes, onions and garlic on a baking sheet and roast for 15 minutes or just until the onions and tomatoes start to get a little char on them. Remove the baking sheet from the oven and let the tomatoes cool for about 5 minutes. Add the tomatoes, onions, garlic, green chiles, cilantro, lime juice and salt and pepper to a food processor and pulse a few times until you get the desired consistency. 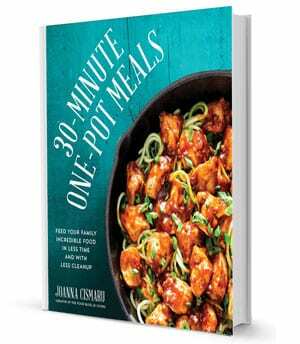 Pour in a bowl and cover with plastic wrap (or an airtight container) and refrigerate for 2 to 4 hours before serving. To add more spiciness to the salsa, add 1 or 2 jalapeños (or other favorite hot peppers) to the baking sheet and roast along with the tomatoes. To get a tangier salsa, add more freshly squeezed lime juice. This salsa will last for 5-7 days in the fridge, or 3-4 months in the freezer. About 1/2 cup. It’s so delicious! Thank you! Looks DELISH! Love home made tomatoes and now is the time to make it hem and enjoy before season is over. Thanks for the roasting tip! 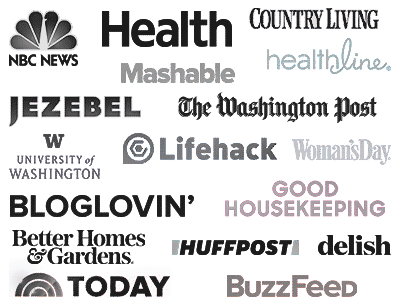 I looked up a lot of salsa recipes and yours won me over! Turned out great! I made this recipe just as described, I drizzled olive oil on the veggies before roasting, and seeded the Tomatoes before roasting. I added two jalapeños fresh picked and one fresh picked green chili. I pulled the skins off the tomatoes when they cooled slightly… The flavor is amazing, perhaps a bit too much heat, I will chill overnight and perhaps only add one jalapeño next time. Is this recipe ok to use for canning? We haven’t tried that before for this recipe. I would use a recipe that’s specifically for canning and storage, because I don’t want you to risk botulism. I made this and it turned out nicely. However, mine didn’t look like the picture 😂 I also substituted fresh jalapenos for the canned green chilies 🔥🔥🔥 and added a little extra cilantro. This was very easy to make and the clean up was a breeze. I used white onions here, but shouldn’t matter. Made this today with my remaining garden tomatoes, roasting the tomatoes, garlic, and onions as directed. Within just a few seconds of pulsing in the food processor, the mixture turned to complete soup. I mean, there was just no salvaging a salsa type of consistency out of it. The spices are nice and I’m going to use it to make a cream of tomato soup tomorrow, but wanted to warn others who may be really needing a salsa end product. And maybe you have some tips for ensuring this doesn’t happen? You probably pulsed it a few seconds to long, it really doesn’t take long at all. I need to start making my own salsa because we buy the jarred stuff use it for our meal and by the time we use it again it’s no longer good. At least when I make it I can control the quantity and fresh always trumps jarred. Love the brightness! Exactly! Hope you do try it, it’s really simple and so good! Yes and there is nothing like fresh salsa….. Thanks for the five stars! My mouth is watering by just looking at these pictures! I will definitely going to try it this weekend. Thank you very much for the awesome recipe! Your YouTube video is so fun to watch. You deserve more subscribers and more views! Keep the awesome vides coming! Thank you very much, and I’ve also subscribed to your RSS. Hi Jo: Is roasting in the oven using the normal bake function or the broiler? This is pretty close to the recipe I always use to make salsa but it never occurred to me to roast the tomatoes, onions and peppers! I normally just chop up some fresh Roma tomatoes (too much liquid and lack of flavor in canned tomatoes) but I will definitely be roasting everything next time.